Specials must be added to the cart from the Today's Specials page. is a powerful free radical destroyer and cell protector. NOTE: Be aware! There may be distributors who will attempt to distract you from the effectiveness of their final product with issues about processing (solvents, vacuuming,...) - these are just marketing ploys. Though World Image Naturals™ Grape Seed Extract is naturally processed, we are aware that it is the purity and effectiveness of the final product that makes the difference. World Image Naturals™ Grape Seed Extract has a Procyanidolic Value of 98.41% - and it's 100% additive-free. The total bioflavonoid content is an unprecedented 580mg in each capsule! Our additive-free Grape Seed Extract formula predates other brands on the Internet, and has stood the test of time. World Image Naturals™ customers keep coming back, because of the purity and effectiveness of the products. Highly Effective Grape Seed Extract Antioxidant Supplement - Combats Free Radicals2. Grape Seed Extract is additive-free - no calcium carbonate ... no magnesium stearate! Grape Seed Extract (GSE) is a natural plant constituent (bioflavonoid) which strengthens and protects living tissue. The OPC1 components in GSE are 50 times stronger than Vitamin E and 20 times stronger than Vitamin C. Grape Seed Extract is an antiallergenic, antihistamine, anti-inflammatory, and antioxidant. It strengthens blood vessels, improves skin, and aids in circulation. As we age, our bodies produce less antioxidants to combat the ongoing destruction caused by free radicals2. This increases our risk of developing serious health problems. Grape Seed Extract is prescribed by doctors in several European countries for the prevention and treatment of a variety of health problems including cardiovascular disease, varicose veins, water retention, collagen damage and arthritis. Because it is used pharmaceutically, it has undergone a tremendous amount of testing. In the United States it is considered to be a dietary supplement, and may be purchased without a prescription. Grape Seed Extract is an extraordinarily safe and effective nutritional supplement. Grape Seed Extract contains natural bioflavonoids called proanthocyanidins which help strengthen and protect cell membranes from oxidative damage caused by free radicals. Catechins, components of Grape Seed Extract, help reduce allergic responses by inhibiting enzymes involved in the formation of histamine (helping reduce symptoms of allergies and excess histamine in the stomach which may lead to further stomach problems). Grape Seed Extract provides cardiovascular protection by preventing oxidation of lipoproteins (LDL), making them less likely to stick to blood-vessel walls. It also makes the linings of the arteries more resistant to damage and helps control excessive clotting. GSE strengthens the capillaries ensuring a good supply of oxygen and nutrients to the brain and throughout the body. It also affects enzymes that influence blood-fluid balances and therefore may be helpful in lowering blood pressure. World Image Naturals™ Grape Seed Extract is the purest available - with no undesirable additives - in pure encapsulated form - not inferior tablets. Each capsule (made from pine bark) contains: 100mg Standardized Grape Seed Extract (95%+** OPC) and 480mg Citrus Bioflavonoids* (Vitamin P). Suggested Dosage: One capsule three times daily. [Each bottle contains 100 capsules - a 33-day supply]. *Citrus Bioflavonoids (aka Vitamin P) have been found to generate an array of health benefits: Reduce Heart Disease Risk, Protect Against Cataract Development, Stress Management, Avert Capillary Bleeding, Curb Heart Attacks and Strokes, Help Varicose Veins, and more. World Image Naturals™ Grape Seed Extract Formula includes a beneficial amount of Citrus Bioflavonoids (480mg with 100mg of GSE). This is unmatched! ** The OPC amount is currently at 98.41%, and 95%+ is set as the lowest possible. 1 Oligomerc Procyanidolic Complexes (OPC) are the active constituents of Grape Seed Extract. 2 Free radicals are highly reactive chemical compounds, which have the potential of damaging human DNA. They can cause malignant transformation of human cells. Free radicals cause negative effects to the immune system, and they are believed to be responsible for some of the changes that the body experiences with aging. GSE can destroy free radicals and promote good health. World Image Naturals™ Grape Seed Extract is the only formula with 480mg of Vitamin P.
World Image Naturals™ Grape Seed Extract is made in the United States of America (USA). World Image Naturals™ Grape Seed Extract is free of all additives, artificial colors and flavors. World Image Naturals™ Grape Seed Extract is free of all gelatin and gelatin capsules. The preceding list was adopted from professional, scientific works which document the helpfulness of the nutrient. This product is not intended to diagnose, cure or prevent any disease. No claims or guarantees for any results are made or implied. 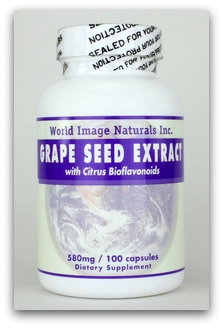 World Image Naturals™ Grape Seed Extract - Experience the Difference! Suggested Use: One capsule three times daily - 33-day supply in each bottle. but safety-sealed bottles contain the same, original formula. Dietary supplements are not intended to cure or treat disease, rather to supply the body with the nutrients it needs to protect and heal itself. The FDA has not evaluated the information contained within this website. The products and information presented herein are not intended to diagnose, cure or prevent any disease. Please consult your nutritionally-oriented, healthcare provider before using any supplements. The effects from dietary supplements, experienced by individuals, may vary (as with all substances); no guaranties are made or implied. Testimonials displayed throughout this website do not necessarily imply typical or potential results for each individual using the same product(s). Medical/Health guarantees/claims cannot be legally made regarding our supplements (or any other). All sales are final. Note: We do our best to ship within 24 hours, but please allow up to 8 weeks delivery time - since our products are made fresh. © 2019 World Image Naturals™, Inc. Copyright © 1994-2019 World Image Naturals™, Inc. • All Rights Reserved!